A car burglar last week nabbed a radio from our car, prompting me to think (once again) about crime in Washington, D.C., where I live. 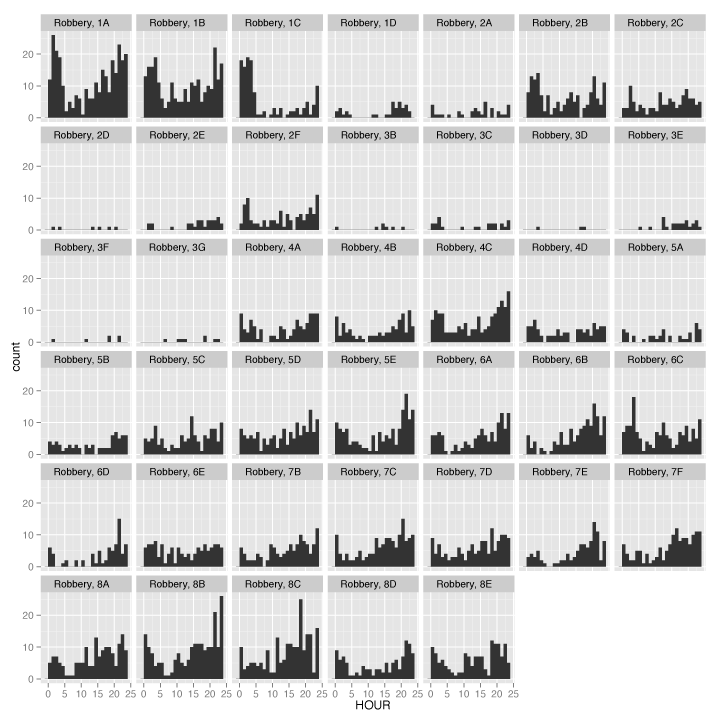 I wanted to know if certain crimes were more common in particular neighborhoods, so I downloaded a list of every serious crime in 2012 from the city’s data portal. The data contained about 35,000 reported incidents of homicides, thefts, assaults, etc., with fields listing the date, time and neighborhood associated with each case. 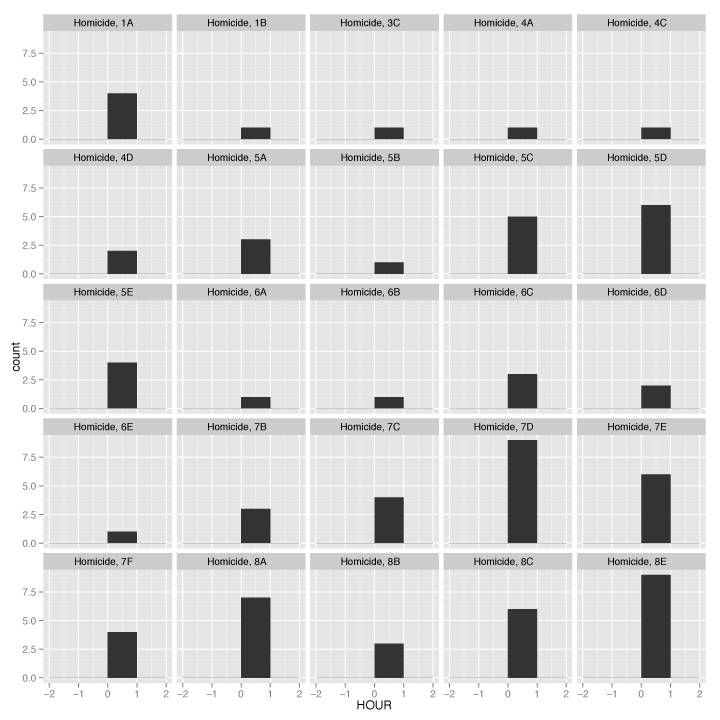 I used the statistical programming language R, which is great for quickly creating small multiples to examine data, to make some rough visual sketches. First, since we’re talking about cars, the first grid shows thefts from vehicles, by hour and “advisory neighborhood commission“. These commissions are the small groups of officials who represent their respective D.C. neighborhoods on issues like real estate development and alcohol sales, among other things. (I live in Brookland, which is governed by ANC 5B). You can find your ANC here. 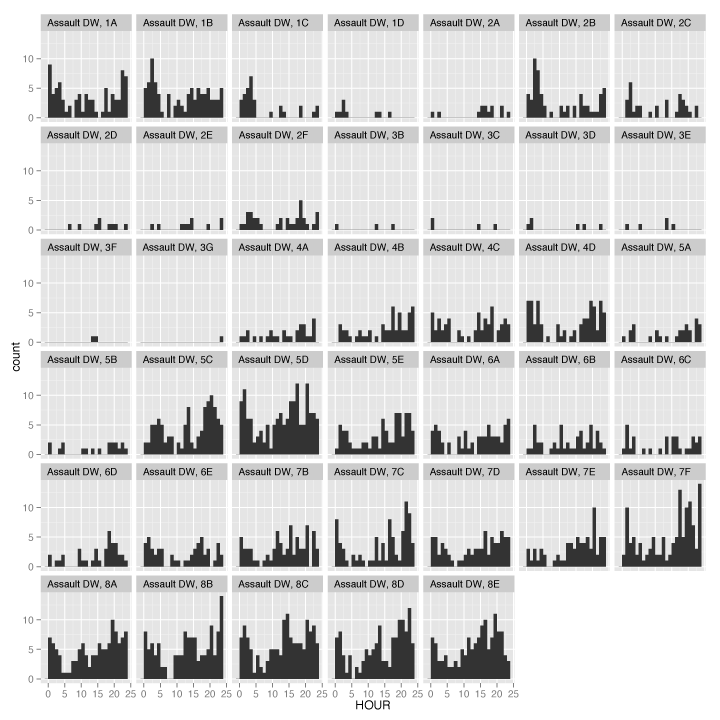 Here are the homicides — all of which get coded as occurring at midnight, so we don’t get to distribution by hour. Still, the result is a simple bar chart that shows the variance by region (7D and 8E had more homicides last year than other locations). 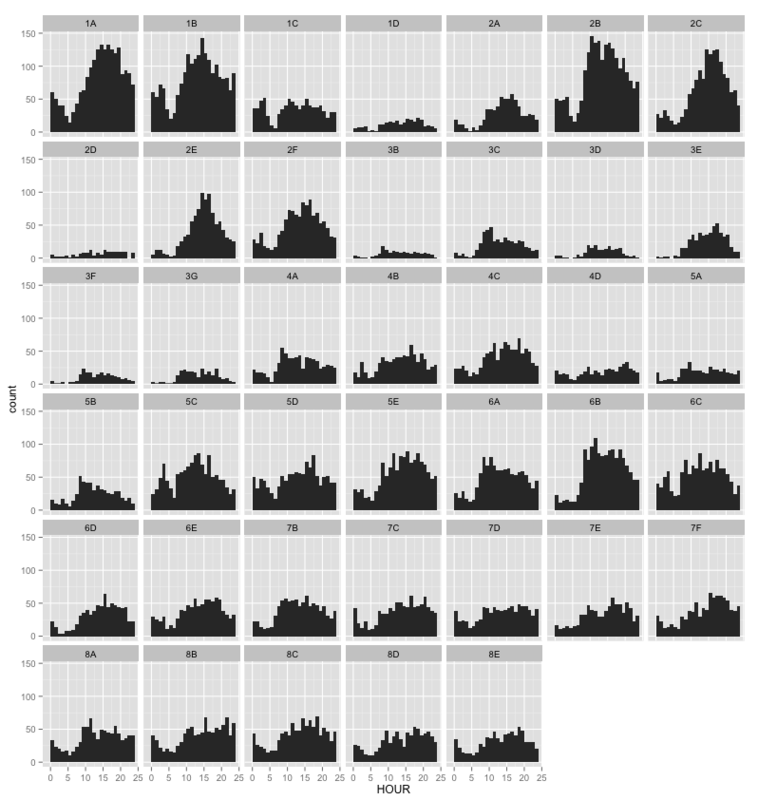 And here’s a grid with histograms for each offense type. Simple thefts (there were more than 12,000 last year) appear to be most commonly reported in the afternoon, while thefts from vehicles are most often reported first thing in the morning — probably because victims notice the crime when they wake up. 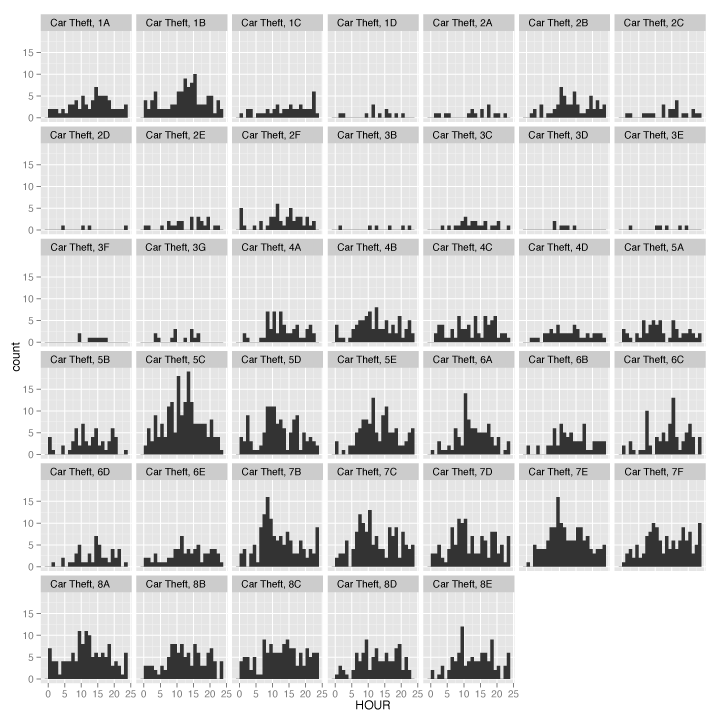 Again, these are just quick sketches, but they show you the power of R in exploring your data before investing time in a more complicated visualization. A look at the basic code also shows how quickly these types of sketches can happen. UPDATE: I’ve written a clarification about this post here. Please read it. A friend posted an interesting data table on my Facebook wall yesterday, which was my birthday. 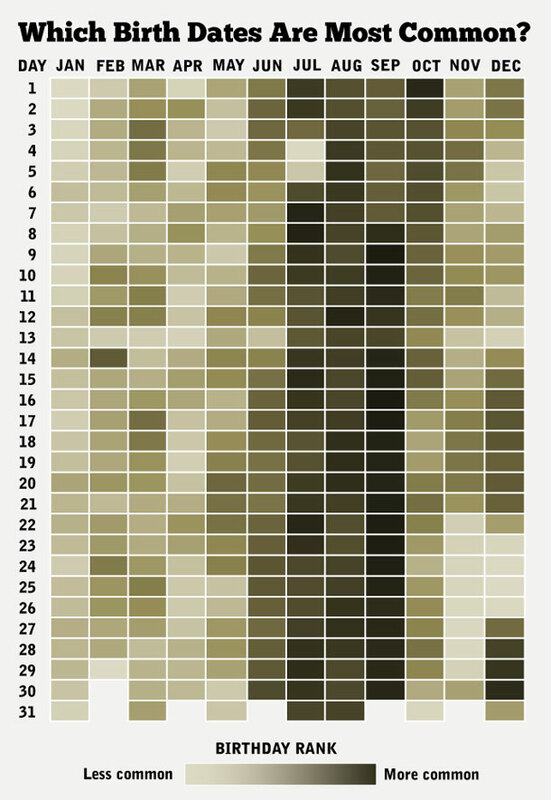 The data listed each day of the year with a ranking for how many babies were born in the United States on each date from 1973 to 1999. Some interesting trends are evident in the data. Apparently, people like to make babies around the winter holiday season because a large proportion of babies are born in September (ours is due Sept. 24, btw). Follow Matt @Stiles on Twitter. * A previous version of this post incorrectly listed Jan. 1 as the least common birth day. 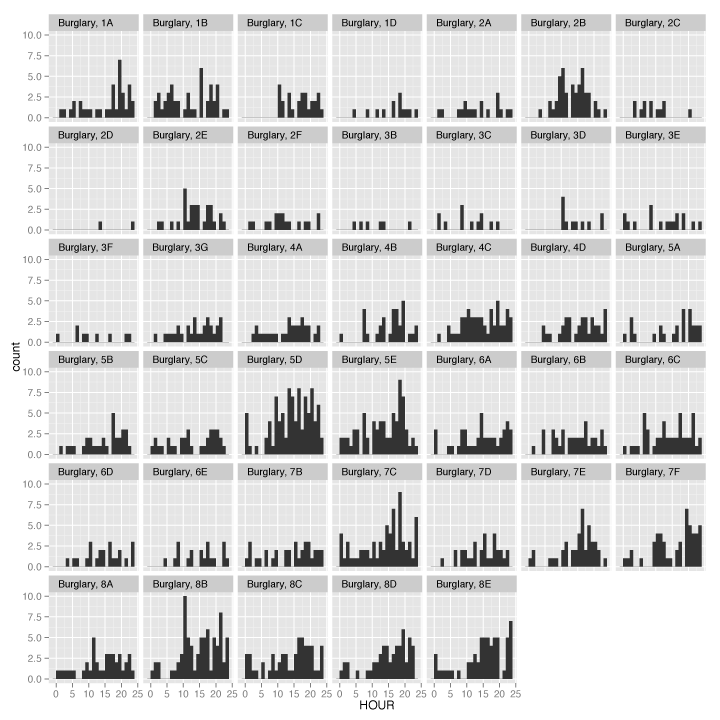 Following Nathan Yau’s excellent tutorial for creating heat maps with time series data (he used vehicle accidents by day for a year), I visualized 3,559 of my tweets back to March 2009. 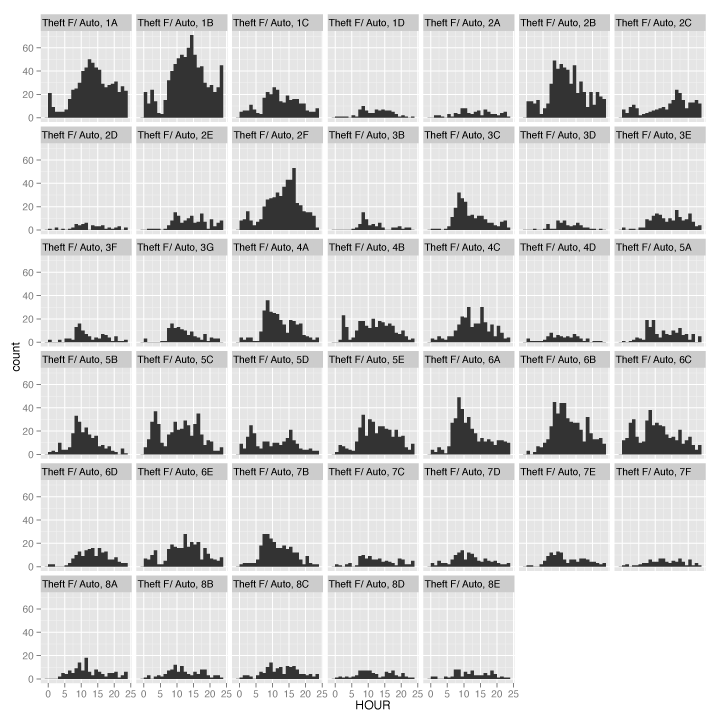 Lately I’ve been experimenting with bubble charts in R based on Nathan Yau’s great tutorial. 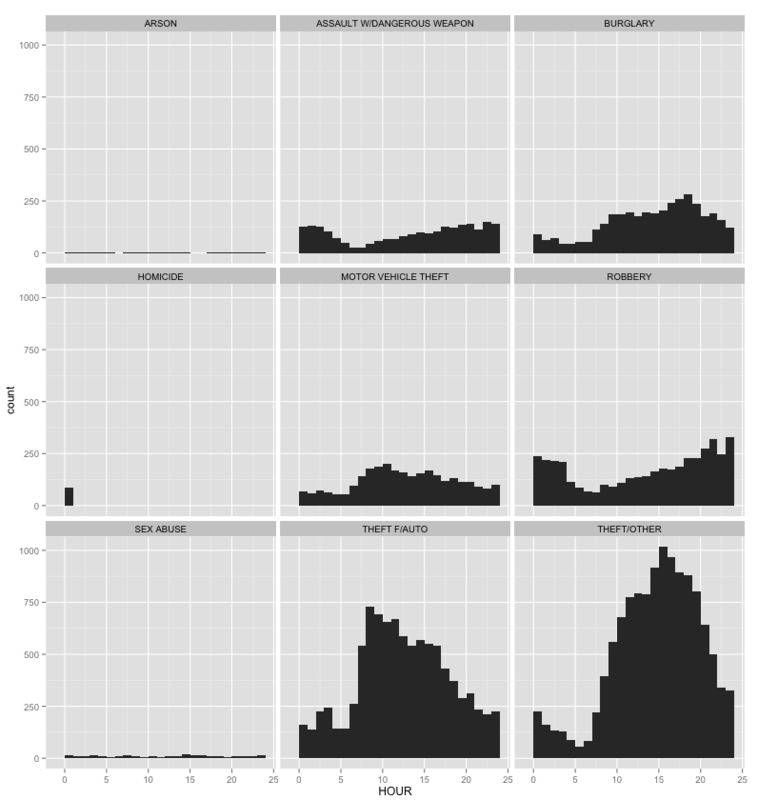 In this case, I wanted to see the relationship between higher education and marriage among women by state. Some states — such as Idaho, Utah and Wyoming — have both high marriage rates and low higher education rates. But that really says more abou those states than whether marriage and higher education correlate. Washington, D.C., for example, has the highest higher education rate and the lowest marriage rate. Still, it’s fun to see how states compare. View a larger version here. Inspired by Nathan Yau’s great tutorial. (Thanks also, Nathan, for the generous help today).